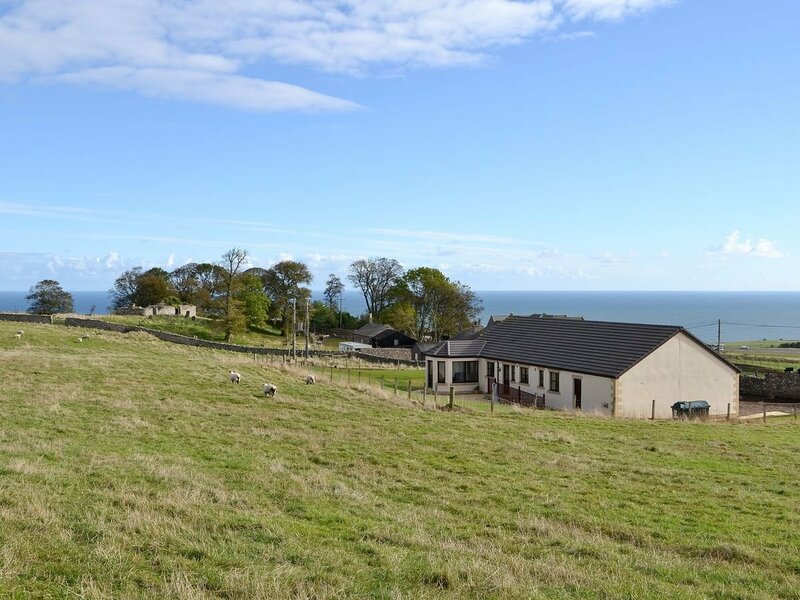 In a wonderfully elevated setting, this light and spacious holiday cottage has sea views of Northumberland’s Heritage Coast from the main living areas. Attractively furnished and decorated, with an enclosed garden and sheltered patio, it’s an ideal spot to relax after a day out. The cottage also caters for the less mobile with wide doors and ramp access at the rear. Situated just 4 miles north of the dramatic walled town of Berwick-upon-Tweed, where there is a good array of shops, pubs and restaurants, along with a theatre. Holy Island, Paxton House and Bamburgh Castle are nearby, or take a boat trip to the Farne Islands from Seahouses. For a fun and hassle free day, Edinburgh is 40 minutes away by train. Shop and pub 2½ miles, restaurant 1¼ mile. 2 steps to entrance (with ramp access at the rear). Living room: With 50" Freeview TV, DVD player and French doors leading to garden. Kitchen: With electric cooker, microwave, fridge/freezer and low worktops. Games room: With pool table. Bathroom: With corner bath and toilet. Shower room: With walk-in shower and toilet. Oil central heating, electricity, bed linen, towels and Wi-Fi included. Enclosed garden with patio and garden furniture. Private parking for 3 cars. Wheelchair access. No smoking. Be the first one to tell us about your rental experience while staying at Maple Lodge. Let us know if the listing matched your expectations. You can share your comments about the location, property owner/manager and all the unique features that made your stay a memorable one.